Sun-filled upper deck. Dining for 6+. Loungers and Fire pit. 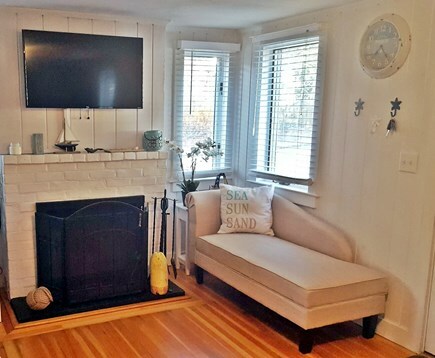 Spacious living room with tucked away stackable washer and dryer. Pub table and stools for additional eating space. Open floor plan living space from kitchen to living room. Queen bed. Memory foam chair. Room for the twin rollaway. 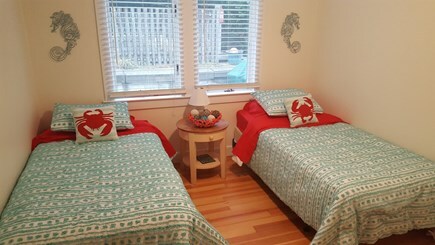 Summer ready twin beds. Closet and dresser not shown. Outdoor hot and cold shower. 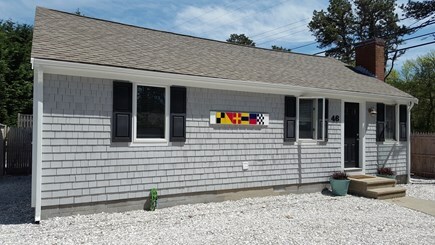 Shed for storage and beach gear. 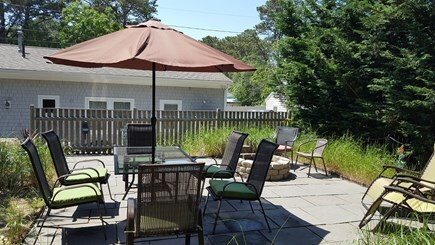 Walking distance to beaches, restaurants and playground. This home has an open concept. 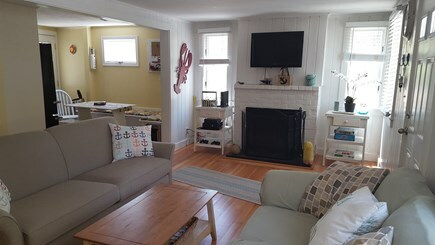 The spacious living room has a tucked away stacked washer/dryer. 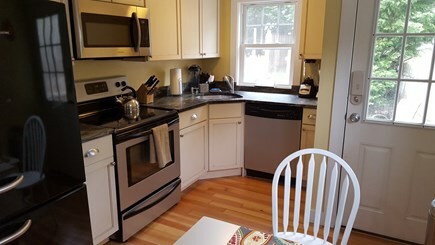 The fully equipped kitchen has granite countertop, microwave and dishwasher. 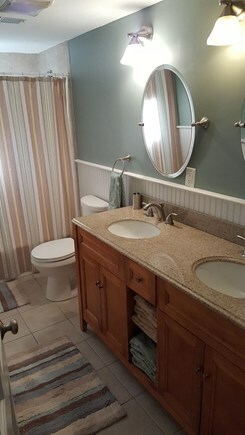 Fully remodeled bath has a full bath, granite countertop and double sink vanities. This home has central A/C, Cable, DVD, Xbox, and Wifi-Internet. 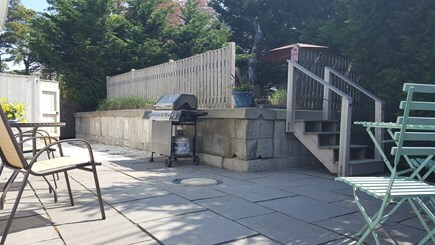 The fenced in back yard has a two tiered patio, plenty of seating, outdoor hot/cold shower, fire pit, and gas grill. The secured storage shed can be used for golf clubs, bikes, strollers...we have beach chairs, boogie boards, 2 kayaks, and 2 bikes for use. 1/2 mile walk (8min) to two different beaches. Less than a 2 min walk to Chapins, Cleat&Anchor, Sand Dollar, What's the scoop, Woolfie's, Joey's Pizzeria and The Dog House. Kayaking, Golf course, and bike trail all within 5 miles. We are so glad you enjoy the house as much as we do!! This house was wonderful for our recent family vacation! 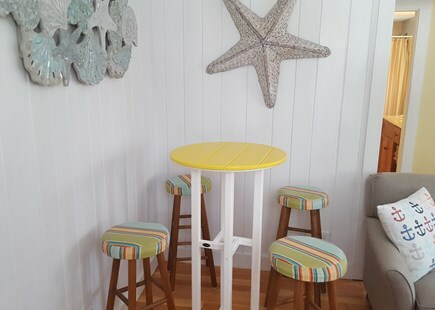 The location of the house is very convenient as we loved being able to walk to the restaurants and the beach. The house is very clean and tidy and was a good size for our family of four. We also liked that it was fenced in as we have small children. We enjoyed our stay and hope to come back next year! So happy you enjoyed your vacation and our home. We love the location as well. Very convenient for all ages. Cute and accommodating. The house fit all 8 people comfortably! Location is central to many places of amusement/dining/shopping/etc. 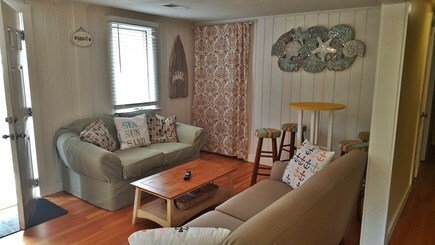 We can't wait to book this property again for future vacations! So glad you enjoyed your stay. We appreciate your feedback and will make sure it is addressed. Hope you come again!! I can't say enough about this beautiful home. We had a wonderful stay and a beautiful week. Amy was so easy to deal and always there if the littlest thing came up. 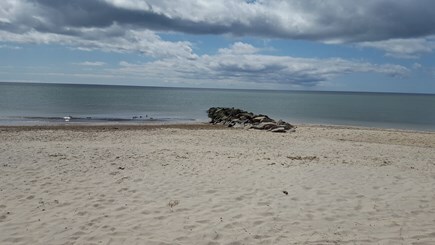 We enjoyed the proximity to restaurants and beautiful beaches. The home included all the amenities one could want and need along with a beautiful fire pit in the back yard. Thank you so much. We look forward to hopefully booking next year in this same spot. Yes, what a week!!! So glad you enjoyed our home and thank you for taking such good care of it. Glad you had a wonderful vacation. Great 4th of July week! This house was set up perfectly. 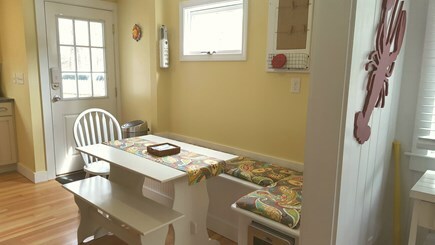 Very nice space for entertaining in the back, close to all entertainment, and just a 8 minute walk to Sea Street Beach. Amy the landlord is very accommodating and is available for any questions you may have. Thank you. So glad you enjoyed it and that your weather was perfect!!! This house was perfect for my beach vacation. The house was clean, comfortable, and a good size. We loved the patio and outdoor shower. Short walk to beach, did it with 2 toddlers and everything went well. Beach was clean and water was great. Walk to great muffin and coffee shop, Wolfies. Walk to ice cream, mini golf, and other restaurants. Lots to do, great vacation! Glad you enjoyed it!! Yes, Wolfies is great and close by. My family and I (husband and three children) had an amazing time at this cozy cottage. The house is immaculate inside and out. 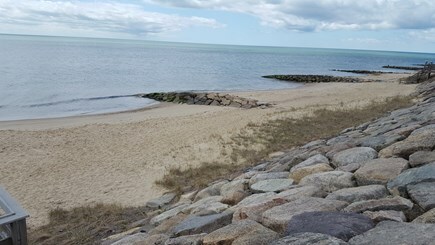 It is a short walk/drive to the beach. 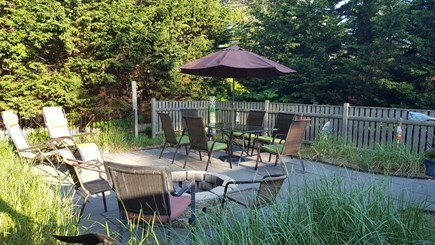 There is a nice patio in the back yard with a wonderful fire pit which we used many nights. There is also a gas grill where we cooked just about all of our meals. 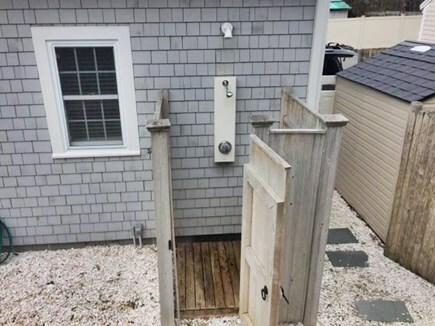 In Cape Cod style, there is an outdoor shower! Can't wait until next year!! Glad you enjoyed yourselves. Riding the current next year at South Village Beach! ???? Thank you so much for your feedback. We are glad you enjoyed your vacation. To clarify, house in corner of Lower County Rd. and Cranberry Lane. The house is well south of Rte 28. The home was equipped with anything you would need for a vacation. 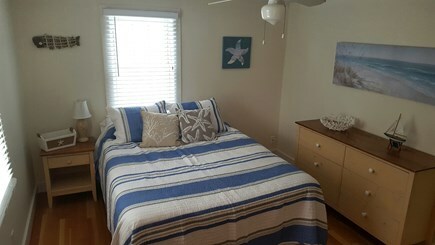 Within walking distance to the beach, restaurants, and convenience store. Plenty of room a great backyard with a fabulous outdoor shower. Amy was very inviting and helpful in all of her correspondence. So happy to hear it! Thank you for taking such good care of our home. We had a great time in this home! Location was convenient to everything. South Village Beach was great. The owners are very nice and easy to rent from. We will definitely come back again. Thank you! Glad to hear it. Yes, South Village is one of our favorites as well.